As suggested earlier, current market conditions are such that the initial cost of purchasing metal lockers is slightly less than the initial cost of purchasing HDPE lockers. However, there is little if any difference between the labor costs to install one compared to the other, so the actual difference is limited to the cost of the manufactured products. One indirect cost difference is the packaging used between the two. Since HDPE is so durable, it only requires a layer of corrugated cardboard to protect it during shipping as opposed to more involved protection that may be used for metal lockers. That translates into less waste onsite and less cost to dispose of or recycle that waste. Of course, as made clear earlier, there is more to the cost of lockers than just the initial price. When comparing metal lockers to HDPE lockers in use over a 20-year period, significant savings are realized due to notably less repair and maintenance costs. The chart below acknowledges the relatively small initial cost difference between metal and HDPE lockers during the first year. By the second year however, the cost of maintenance, repairs, painting, and cleaning, including graffiti removal, are more for metal lockers, so much so that any initial cost savings are lost. By the fifth year, these painting, maintenance, and cleaning costs are notably higher for metal lockers and continue to increase significantly through the 10th and onto the 20th year to the point where they exceed the original cost of the lockers, perhaps several times over. Hence the accumulated overall life-cycle savings of HDPE lockers compared to painted metal lockers are substantial. 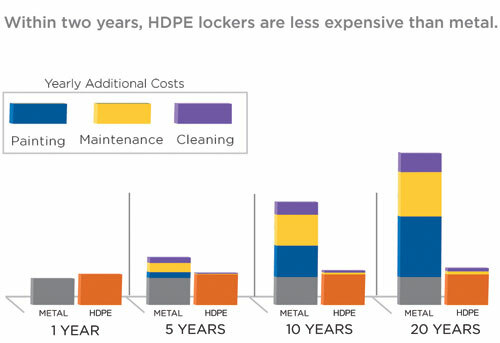 The actual ongoing cost of cleaning, painting, and maintaining metal lockers compounds notably year after year while comparable costs for HDPE lockers stay low. Within two years, the total cost is virtually equal. By 10 or 20 years, metal lockers start to cost several times more. When lockers are used in most enclosed rooms such as a locker room, they are regarded as furnishings or fixtures. From a code compliance standpoint they are treated as movable items and regulated differently than permanent finishes or items in a space. In a corridor, particularly one used for general egress in schools, any materials used generally receive greater scrutiny for safety and fire resistance. A commonly cited test standard for fire resistance in buildings is the National Fire Protection Association standard NFPA 286 titled “Standard Methods of Fire Tests for Evaluating Contribution of Wall and Ceiling Interior Finish to Room Fire Growth.” This standard describes “a method for determining the contribution of interior finish materials to room fire growth during specified fire exposure conditions.” This method is commonly used to evaluate the flammability characteristics of wall and ceiling interior finish, other than textile wall coverings, where such materials constitute the exposed interior surfaces of buildings. Note that this fire test method is not intended to evaluate the fire endurance of assemblies, nor is it able to evaluate the effect of fires that originate within a wall assembly. In the case of using plastic lockers in a corridor they must pass the NFPA 286 test to be in compliance with the 2012 edition of NFPA 101, the Life Safety Code. When specifying plastic HDPE lockers you should request NFPA 286 test results from manufacturers you are considering to include in the specification. 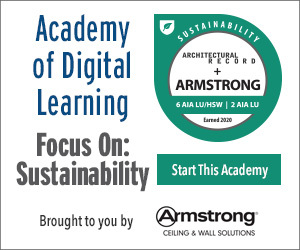 Only those that pass this test can reasonably be considered for code-compliant installations that address safety, particularly in schools.